I'm sorry to report that in addition to Judy's 50th high school reunion on Saturday, April 28, we now have an unavoidable family obligation that will take up that entire week. So I won't be able to attend the Thursday and Friday events in Claremont and then fly to Orlando on Saturday for Judy's reunion. Since I greatly enjoyed the two reunions I've attended, I'm sad about this, and I have promised myself that I WILL be there for our 50th. But I fear there won't be a repeat of the Brahms then! 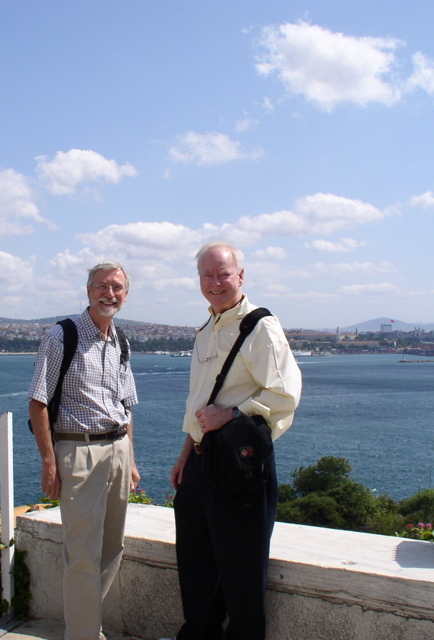 (b) During an extended trip to Istanbul and Greece last fall, Judy and I were privileged to spend a delightful week with Finlay McQuade and his wife, Lynne Giallombardo, both of whom teach in Istanbul. Finlay's term at Bosphorus University had not yet begun, and he kindly showed us all around Istanbul, which we found to be a fascinating and beautiful city. My very best to all my classmates.